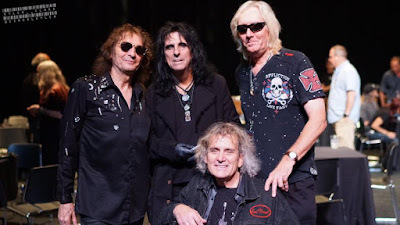 Alice Cooper will reunite with his original band members Dennis Dunaway, Neal Smith and Michael Bruce during a series of shows on a newly-announced UK tour this fall. Following a 2015 reunion performance at a Dallas, TX record store and a recent live appearance in Nashville, TN last month, the surviving members will regroup to deliver mini-sets during Cooper’s five-show UK run in November alongside his regular touring lineup. The shows – which include openers The Mission and The Tubes – will begin at the First Direct Arena in Leeds on November 11, and include stops in Glasgow, Birmingham, Manchester and London. General public tickets will go on sale Friday, June 16 at 9:00 a.m. local time. "When the original band broke up in 1975, there was no bad blood," explains Cooper. "There were no lawsuits – we had just burned out the creative process. We had gone to high school together and had recorded something like five platinum albums in a row. We were never out of sight of each other for 10 years. Everybody just went their own way. Neal, Dennis and I always stayed in touch. Mike disappeared for a while and Glen Buxton passed away in 1997, which was a big blow. Due July 28, “Paranormal” reunites the rocker with producer Bob Ezrin and includes guest appearances by U2 drummer Larry Mullen Jr., ZZ Top's Billy Gibbons and Deep Purple bassist Roger Glover.